The incident happened at around 5.20pm yesterday evening. GARDAÍ ARE APPEALING for witnesses following an assault on a Dublin Bus on Monday evening. At around 5.20pm, gardaí from Clondalkin responded to a report of a incident on a Dublin Bus that was travelling on the N7 Naas Road. A video of the incident, seen by TheJournal.ie, shows a man repeatedly headbutting and punching another man in the head near the front door of the bus. Two other men also became involved in the incident. The man was eventually pulled off the bus. Another video shows the injured man lying on the street beside the parked bus, with blood on his head. Members of the public gathered around him. Gardaí are currently working to establish the identity of those involved. They are appealing for witnesses or for anyone with information to contact Clondalkin Garda Station on 01 666 7600, the Garda Confidential Line on 1800 666 111, or any garda station. 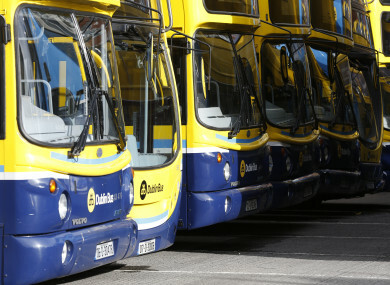 Email “Gardaí appeal for witnesses after man repeatedly headbutted and punched on Dublin Bus”. Feedback on “Gardaí appeal for witnesses after man repeatedly headbutted and punched on Dublin Bus”.